Chateau Cote de Baleau is a small vineyard in the St. Emilion appellation managed by Sophie Fourcade. For years, Sophie Fourcade had her hands full as she was also in charge of the neighbouring estates, Clos St. Martin and Chateau Les Grandes Murailles. All three Right Bank estates are located in St. Emilion. 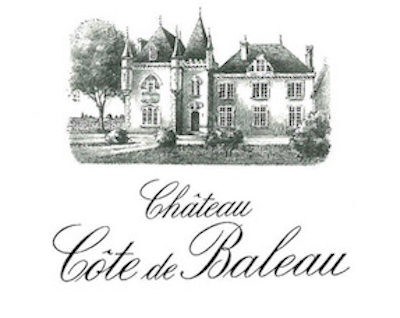 Chateau Cote de Baleau has remained in the hands of the Reiffers family for generations dating back to the reign of King Louis XIV, when an ancestor of the current owner was awarded the Saint Emilion vineyard for his exploits as a loyal soldier. That changed in March, 2013, when the Cuvelier family, the owners of Clos Fourtet and Chateau Poujeaux in the Haut Medoc appellation, headed by Matthieu Cuvelier, purchased the property. Chateau Cote de Baleau vineyards, terroir, grapes. The vineyard of Chateau Cote de Baleau consists of 17 hectares. 14 of those hectares are classified. In fact, in the recent 2012 St. Emilion Classification, those 14 hectares were upgraded to Grand Cru Classe status. The estate also owns 3 hectares of unclassified vines. Chateau Cote de Baleau is situated just outside of the St. Emilion village. The terroir consists of limestone and sand soils, located not far from La Gomerie . The vineyard is planted to 70% Merlot , 20% Cabernet Franc and 10% Cabernet Sauvignon . The age of the vines is impressive as the vines are on average, close to 40 years old.